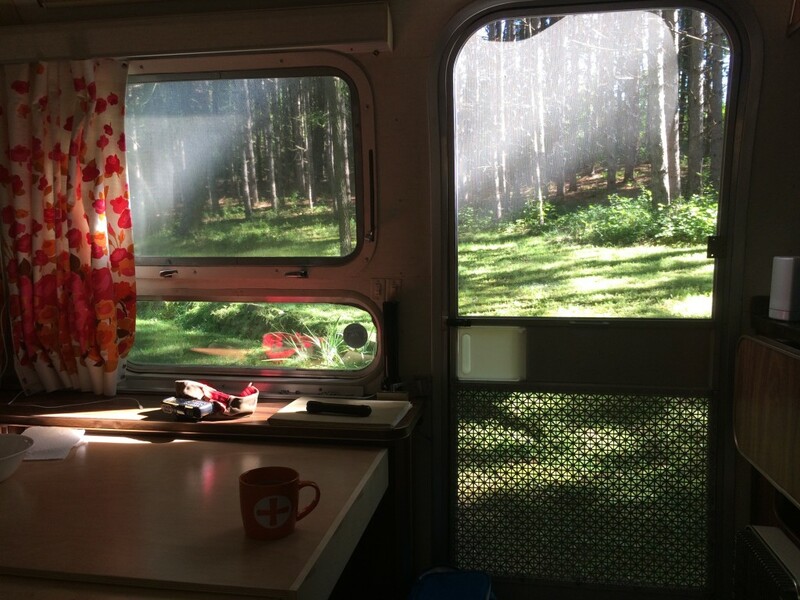 A handful of people have made me promise to share all the down and dirty, irritating and generally un-fun aspects of living full-time in an Airstream with 2 kids. Well, this is that. You’re welcome. The Airstream was stored at my father-in-law’s after we purchased it last summer. It was in a wooded area, so unfortunately we had a minor mouse problem. We put in some traps and checked them every week or so and cleared out a handful of mice. No big deal. We’ve lived in a 100+ year old house, a few mice don’t scare us! (Okay, truthfully, I despise them, but I’ve been down this road before.) The Airstream then spent most of this spring and summer sitting in the driveway while we worked on it so there weren’t more mice, but we still kept the traps in it just in case. After our first camping trip this summer we put it back in the woods for a month or so until move-in day. When Nick picked it up to take it to his mom’s the morning we moved in, he opened it up and first thing he noticed was dozens, yes, I said DOZENS of dead flies, then the unmistakable stench of death. Didn’t take him too long to check all the traps and find the partially melted, maggot infested mouse carcass that was the source of the mayhem. Perfect, the day we are moving in and not only do we have dozens of dead flies and a gooey mouse carcass to clean up, we also have the death stench to deal with. Long, gross story short, we got it all cleaned and disinfected and sufficiently aired out and continued with the move in. It’s been a week now since we officially moved into the Airstream, and we are just about 10 miles closer to Florida – our final destination for this fall / winter. We moved out of our townhouse rental about 8 days early, at the request of the owner who had new renters itching to move in. They gave us the option to stay, but we were okay moving early, it just meant we had 7 fewer days to take care of the final decluttering. Luckily, Nick’s mom has a beautiful property with plenty of room for us to park the Airstream, and an extra garage where we can sort through all of the stuff we weren’t sure what to do with at the end. 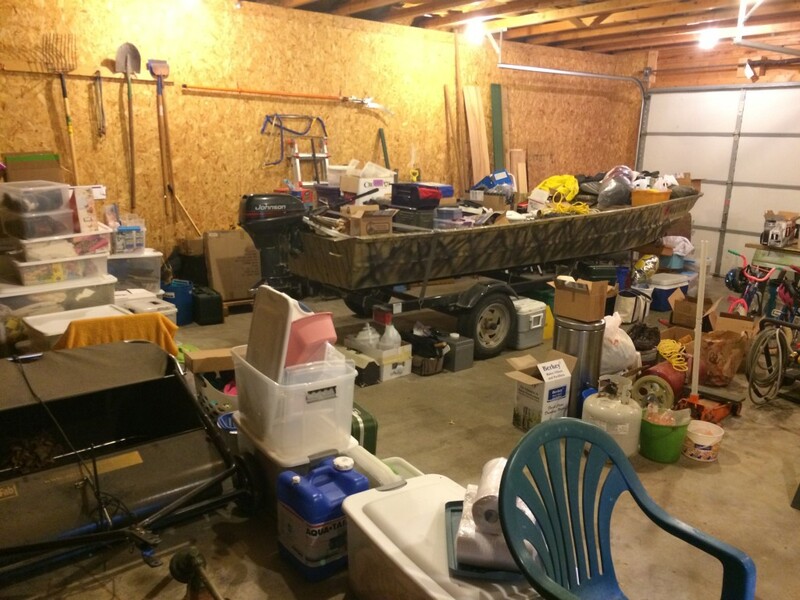 They don’t keep much stored in their garage, except lawn care implements and a fishing boat. The boat seemed like a good place to toss all the random crap we need to sort, so…there you have it. I thought we had done a good job of downsizing (and I still think that) but I’m not sure you ever really know how little space you’re dealing with until you start moving stuff in. We’ve still got way more stuff than space. We’re kind of stuck until we can declutter down to what will fit in the truck and the Airstream. One of our motivations for this lifestyle choice is freedom, the freedom you get when you shed all the unfulfilling obligations and unnecessary stuff from your life. We’ve pretty much eliminated those unfulfilling obligations, but unfortunately, I’m still feeling a bit weighed down by the excess stuff – it feels like an anchor that we just can’t quite seem to pull up. I’ll be glad to have it all gone, and I’m sure we will get there soon. This is my view from the breakfast table. I suppose there are worse places we could be “stuck”.